RansenScan - Speed up the scanning of photo and card collections with RansenScan. This scanner utility reads multiple photos in a single scan and lets you to copy the individual photos to the Windows clipboard, or to save them to named files. $29.99. 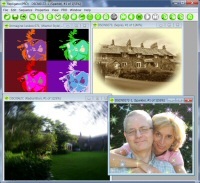 PhotoToMesh is a Windows program which converts photos to 3D volumes and surfaces. The meshes can be saved as flat or cylindrical DXF or StereoLithographic files. A free demo is available, and the full version costs only $34.99, (V4) or $49.99 (V7). Pointor Pointor imports point data from text files, databases and spreadsheets into a DXF file which can then be read into a wide variety of CAD programs. It also creates pointlists from DXF files. Standard Version: $69.99, Pro Version: $99.99. Gliftex is a great way to create textile designs, backgrounds and decorations. Simply guide Gliftex into creating the designs, then fine tune them if you want to. The home version costs $14.99 and the Pro version costs $24.99. ShapeToDxf converts Esri Shape files into DXF files ready for your CAD program, or any program which accepts DXF files in fact. A free and fully functioning demo can be downloaded by clicking on the link below. Price $49.99. The online app at EuEnergyLabels.Com creates labels for shop display of white goods in the European Union. The law which specifies these labels came into force in 2010. All white goods, TVs etc. have to display a standard energy label on them to help informed consumer choice. This app takes the pain out of creating the labels for manufacturers and resellers alike. "Inventor Programming in C++" is available from Amazon as a Kindle eBook. Repligator adds special effects to your photographs and images. This award winning easy to use program has 150 effects. Download the free demo and see for yourself! The Home version costs $9.99, the PRO version $19.99. LIDARtoDXF creates AutoCAD compatible 3D DXF files from GIS LIDAR files, and it's free!